Topic: Fun quiz. 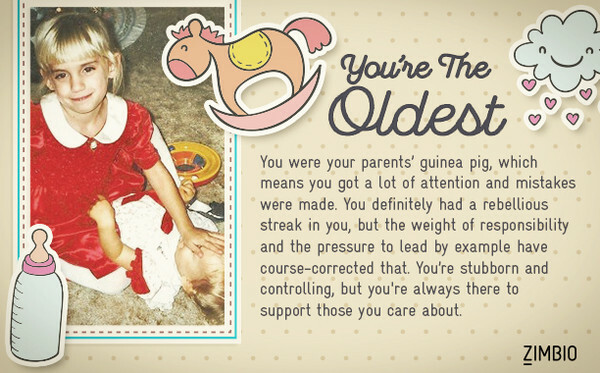 Can these questions guess your birth order. Re: Fun quiz. Can these questions guess your birth order. Eldest, that's me - my parent's experiment. You can call me Al.. I got youngest ..and i am by 20years!!!! The less you give a damn the happier you will be. It told me I'm the oldest, I'm not, I'm the middle one. But some of the questions were rubbish, I don't have a clue about the K sisters for instance. I was always a rebel, always in trouble! So many "none of the above" questions! Disney princess indeed! Well I would like to say I am now retired . Right I am the eldest .